That’s Job’s question. It’s a Holy Saturday kind of question. It’s a question all of us ask on the Holy Saturdays of our lives. Holy Saturday, however, is not only a day on the liturgical calendar, it is also a reality experienced in each of our lives. That’s how liturgy works. It reflects and images back to us the reality of our lives. On the calendar Holy Saturday is the next day, the day after Good Friday. In life Holy Saturday is also the next day, the day after. It is the day after the funeral. It is the day after the body has been buried. It is the day after the relationship ended. It is the day after the dream was shattered. It is the day after we tried and failed. It is the day after the diagnosis. It is the day after the tragedy. It’s the day after we admitted our life was a mess. It is the day after we realized life is not going the way we planned or intended. It is the day after we made the wrong decision. It is the day after our life was forever changed in ways we neither asked for or nor wanted. So where is he today? Where is Jesus on the Holy Saturday of your life? The Church has something to say about this. Look on page 96 of the Book of Common Prayer. What does the Apostles’ Creed tell us? Look on page 53 of the Book of Common Prayer, a different translation of the Apostles’ Creed. Where does it say Jesus is? We are never abandoned on the Holy Saturday of life. Jesus has descended to the dead parts of our life. He has entered into the hell of our lives. That’s where he is on this day. And if it feels like your life has been shaken to the core on Holy Saturday know this; it’s not your life being shaken, but the gates of hell being torn down. It is hell itself shaking with fear at the presence of Christ, trembling and regretting that it ever presumed to take captive the Author of Life or one of his children. This is Christ’s harrowing of hell. 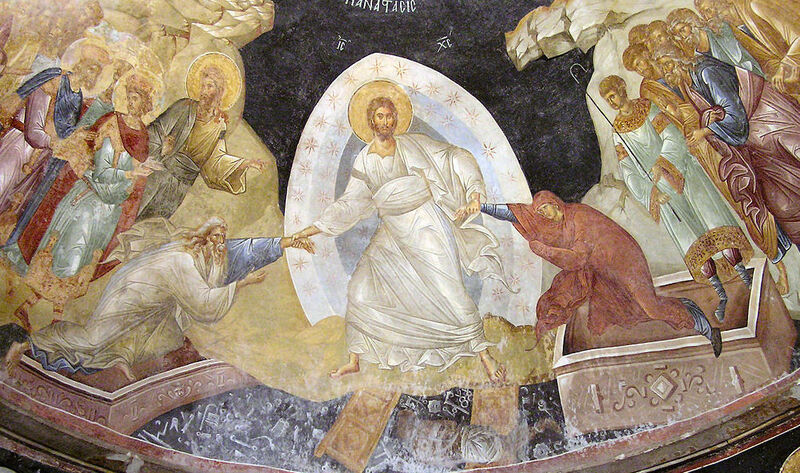 On Holy Saturday Christ reaches into the abyss of death and pulls Adam and Eve from the grasp of death. Adam and Eve represent every man and every woman. They are you and they are me. “If mortals die, will they live again?” Hell yeah! Very good, much to think about. Thank you Kay. Happy Easter. very well put! Thank you. Delda, happy Easter. Christ is risen. Alleluia. Thank you Narelle. May Christ’s peace and Easter life fill and sustain you. Narelle, thank you for reblogging the sermon but mostly thank you for your tender and thoughtful words about Brandon and me. Happy Easter. Christ is risen. Alleluia. Carol, I am glad the sermon was helpful. I know it won’t fix anything but maybe it let’s you establish yourself in Holy Saturday and trust the liminality of the day, no matter how long it lasts. I know that even in the uncertainty of that liminal space a promise resides and is being fulfilled. The promise is never to leave us in our tombs. Regardless of how long it may take the promise will be fulfilled. I am so sorry for your loss. I will remember you and your mother in my prayers.